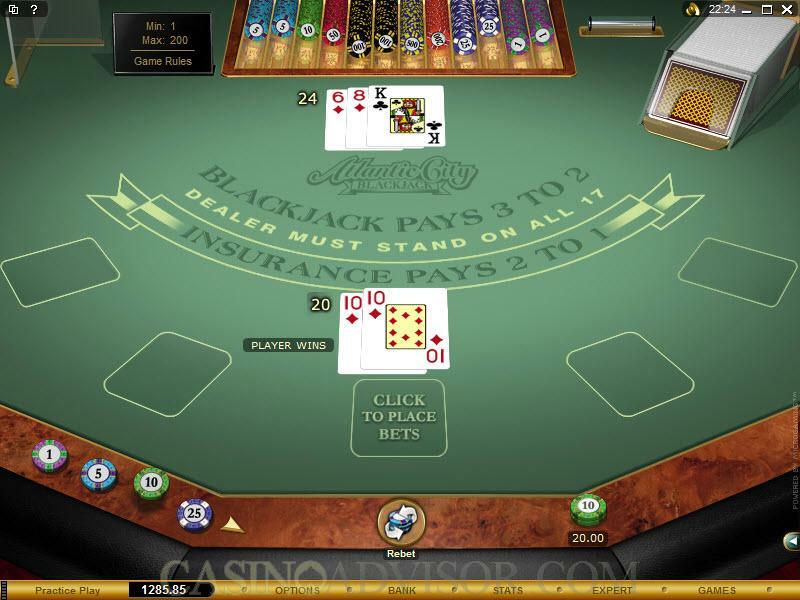 The Gold Series Atlantic City Blackjack game is yet another great offering that has been designed and developed by Microgaming, the foremost manufacturer in the world of online casino software. The game features very vivid graphics, speed that is adjustable, flexible sound controls and a selection of game options, producing a pleasurable and genuine atmosphere for gaming. The game is played with eight decks of 52 playing cards which are shuffled after each round of play. This is what insures a "random" shuffle on each hand. The object of the game is to beat the dealer by either by obtaining a total of 21 or less that is higher than the dealer's total, or by staying under a total of 21 while the dealer exceeds the total of 21 (known as a "bust"). The dealer takes a hole card, and when he has an Ace or ten-value card (10, J, Q, K) showing, checks under that hole card for a "blackjack" (a two-card 21), which will automatically beat the player unless the player himself has a two-card 21 (also known as a "natural"). Along the way the player has the option of splitting pairs or doubling on any two cards that are dealt him. There is also the option of insurance, which can be purchased when the dealer has an Ace showing, and which pays off at 2-to-1. And late surrender is featured, allowing the player to save half the bet on occasions where his/her hand is especially weak and a likely loser. There are features built into this game that can make it simple for the player to compete without dealing a lot with the software. The options of Auto-Rebet and Autoplay, available after switching into Expert Mode, not only provide for the same bet to be made over and over again, but for the strategy decisions to be automatically made as well. Interested in reading more detailed information about Gold Series Atlantic City Blackjack? If so Click Here for more details.